You can not build your dream house unless it is not very well equipped with the appropriate furniture and other accessories. We spend hundreds and thousands of dollars in making our dream house. We hire professionals to bring more and more perfection to our living place and we go to any extent in the beautification and furnishing of our house. Major finances of our life are spent on the making of our dream house. Furniture is probably the most important and integral part of the house. Only walls and floors can not make a house, people and furniture turn it into a living place. I remember when I first built my house, the major expenses were made on buying stylish luxury branded furniture. My wife is literally in love with ever changing trends of furniture and she is like always geared up to go for the new one. In the beginning it was not that hard but later on I realized that these branded furniture items rapidly drain out my wallet. Then I learnt the awesome skill of upcycling wooden pallet from a pal of mine who was long into this. And right from that day I am making experiments every passing day. I have repurposed the pallet into numerous practical furniture items. 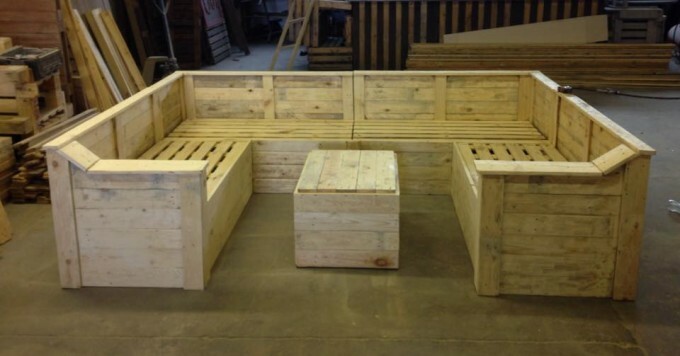 Today we are going to discuss the possibility of making a pallet wooden sofa with table. Here is the demonstration of the project. 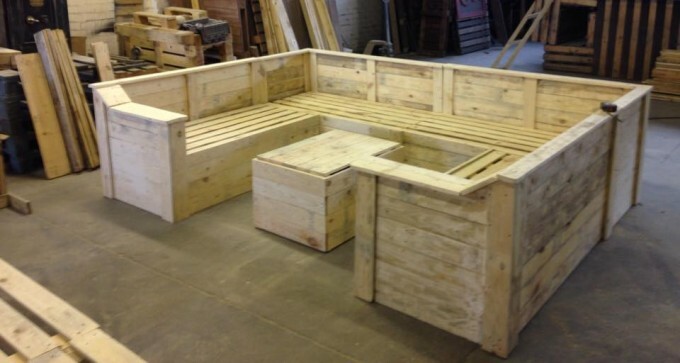 Look at the entire structure carefully, whole of the furniture is made by recycling the wooden pallet. This is basically ten seated sofa which is pretty huge with wide armrests. While the seats are also pretty spacious and the matching coffee table placed in the middle is also shaped and designed accordingly. A perfect sitting arrangement for your lobby or drawing room.